The alate vivipara of Rhopalosiphum padi (see second picture above) is green, with a rusty red suffusion around the siphuncular bases. It has marginal tubercles on most or all of abdominal segments I to VII. The apical rostral segment (RIV+V) is 0.75-0.95 times as long as the second hind tarsal segment. The longest hairs on antennal segment III are 0.53-0.76 times the basal diameter of that segment. The second picture below shows an ovipara and a male Rhopalosiphum padi. The micrographs below show an apterous second-generation female of Rhopalosiphum padi from the primary host (first image) and an alate female produced on the secondary host which has returned to the primary host (second image). 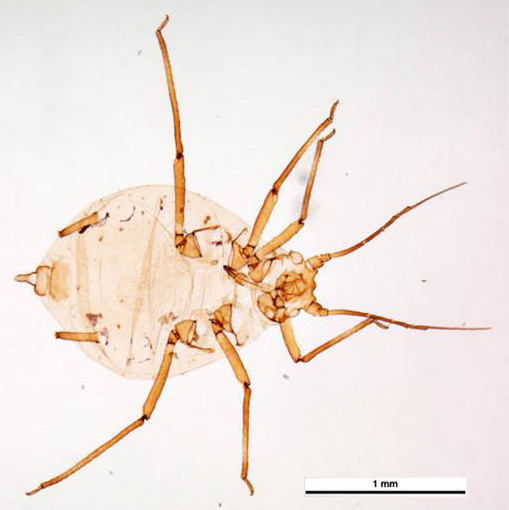 The clarified slide mounts below are of adult viviparous female Rhopalosiphum padi : wingless, and (male?) winged. Bird cherry (Prunus padus) with its long drooping white flowers (below) is the primary host of Rhopalosiphum padi. The eggs of Rhopalosiphum padi are laid in autumn in the narrow gap between the axillary buds and the stem (see image below). Leather (1983) estimated there is only enough room in this site for 10-15 eggs to be adequately protected from predators, and has shown that post-oviposition there is a period of density-dependent mortality where eggs in suboptimal sites are predated. Predators include spiders and birds. 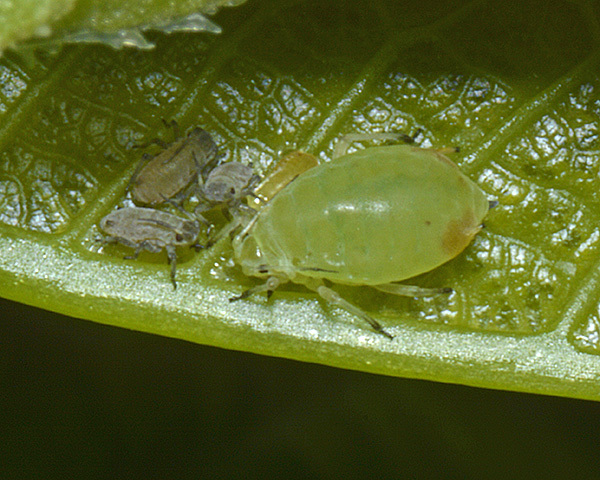 After egg hatch, the newly emerged nymphs (see first picture below) move to the unfurling bird cherry leaves where they feed and develop (see second picture below). If nearby buds have opened, this move is readily achieved, but sometimes the newly hatched nymphs have to move some distance to access suitable young growth. Such nymphs may well be subject to high mortality rates. 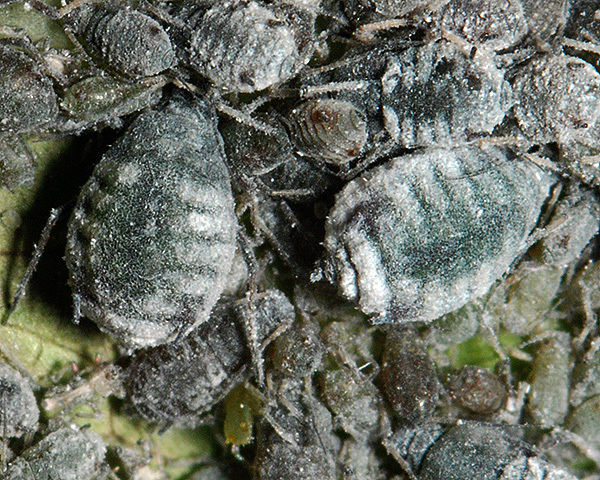 Once they have found suitable fresh growth, the nymphs develop rapidly into very large light-green mature fundatrices (see picture below). The fundatrix of Rhopalosiphum padi on bird cherry (see second picture above) is pale green with small areas of rust red suffusion around the siphunculi. It is 2.5-3.0 mm in length, much larger than the other morphs. These fundatrices give rise to a second, wax-covered, generation. Their feeding activity stimulates the development of a rolled leaf gall. 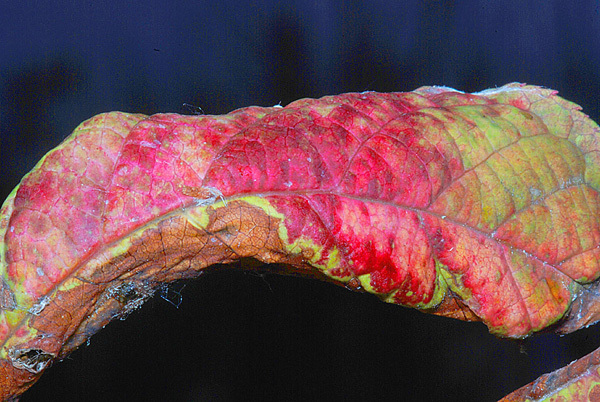 Young galls are green but later in the year they may be multicoloured (see picture below). 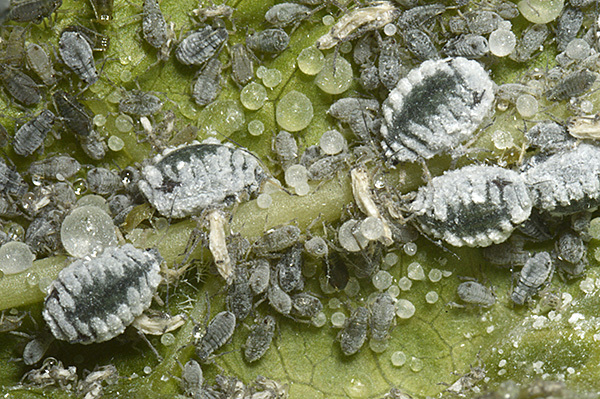 These aphids need young actively growing tissue if they are to induce a gall. Galling seems to improve the habitat quality for Rhopalosiphum padi and enables another generation to develop before the production of emigrants (Leather & Dixon, 1981). 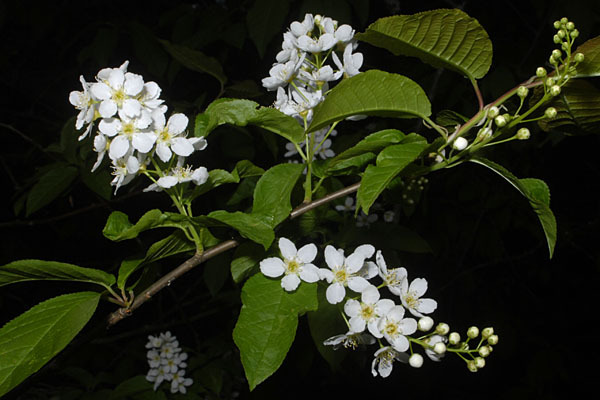 Leather & Dixon (1981) showed experimentally that the fundatrices and oviparae of Rhopalosiphum padi as well as having an intrinsic preference for bird cherry over other plants also do better on particular growth stages of their primary host. Each morph in the sequence that constitutes the life cycle seems to be adapted to a narrow window of habitat quality within the spectrum available to the species as a whole. 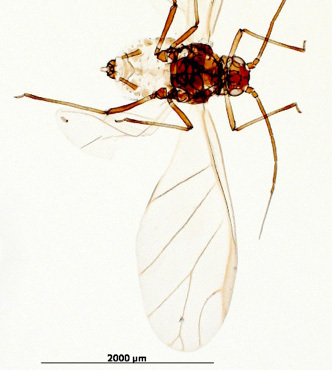 Dixon & Glen (1971) showed that both crowding and poor nutrition (such as mature leaves) induce the appearance of winged emigrants in Rhopalosiphum padi (see picture above). 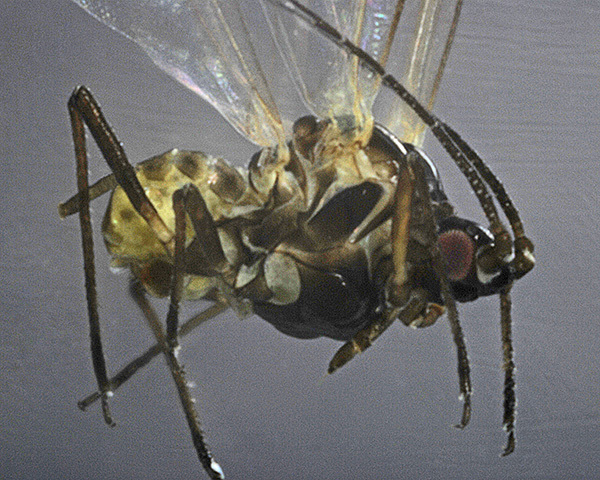 The highest proportion of alate exules develop when both mother and offspring are crowded. 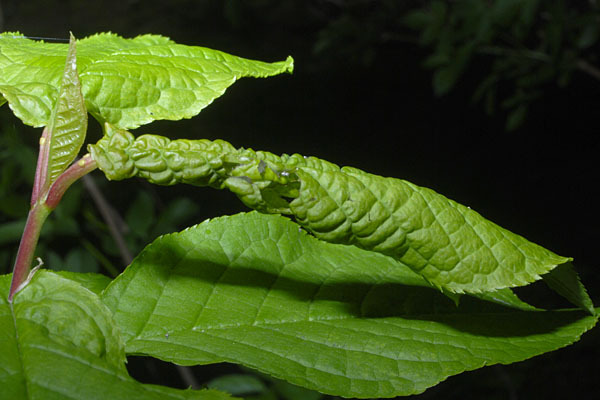 When crowded, aphids may leave the gall and form very large colonies on the young shoots of the bird cherry (see picture below). 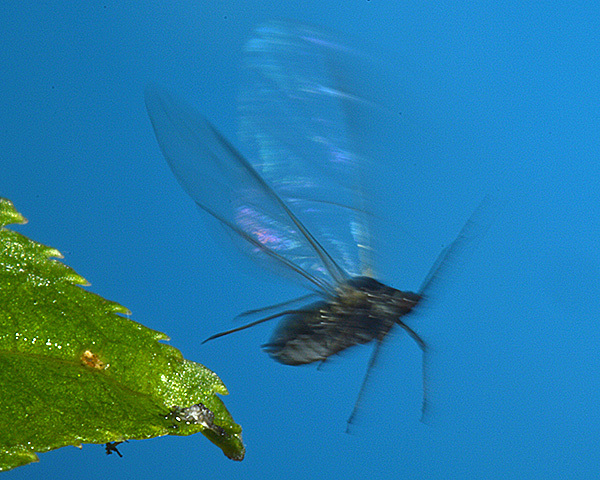 On younger leaves the wax-covered nymphs develop to large, highly fecund, wingless adults - which then give rise to winged emigrants in the subsequent generation. 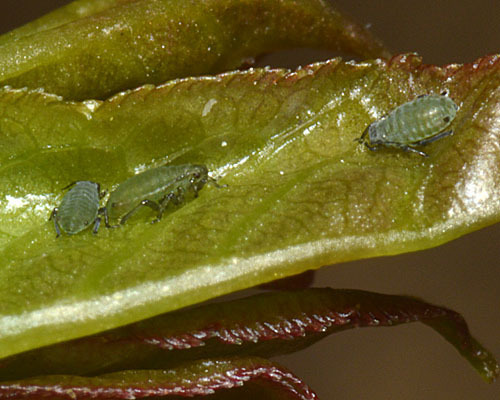 This flexibility in their life cycle enables aphid population to adapt to local conditions, and is one reason why aphids are such a successful group. 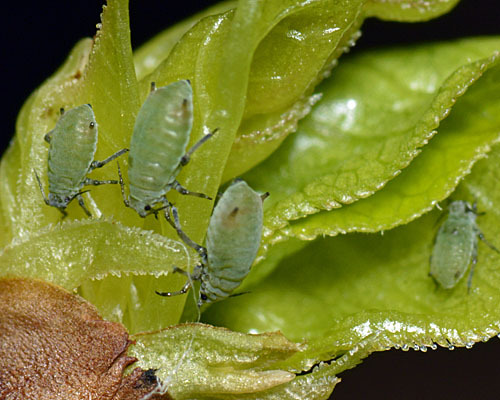 Several researchers have used the host-alternating bird cherry-oat aphid to investigate the reasons and underlying mechanisms for the change in host. 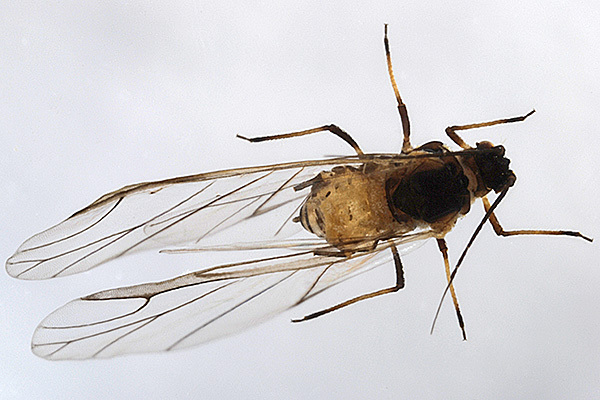 Dixon (1971) showed that emigrants of the host-alternating bird cherry-oat aphid fly from the primary host to various grasses before the end of June, even in the absence of natural enemies on bird cherry. 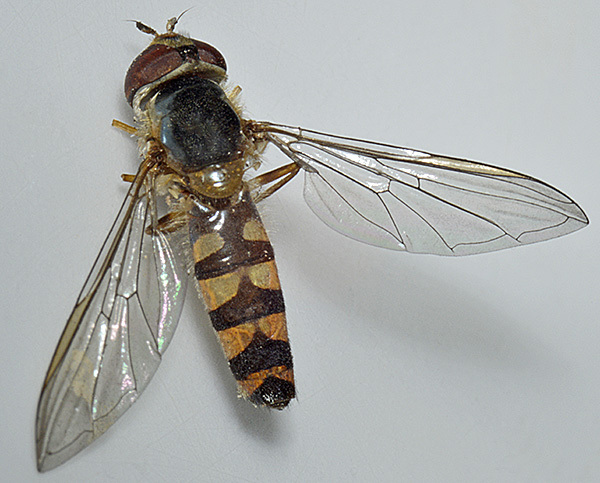 They fly before the leaves of bird cherry mature and at a time when numbers of insect predators are rapidly increasing. The growth efficiency of Rhopalosiphum padi on bird cherry and oats indicates that the quality of the available food on the two hosts is markedly different. Apterous exules prefer oats to young bird cherry leaves and survive best on oats. 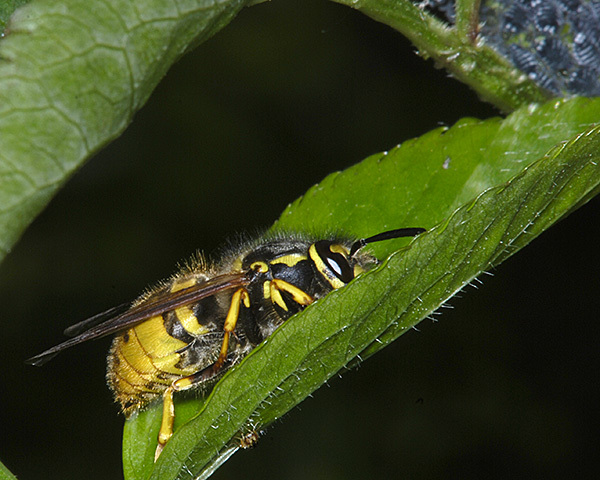 Gynoparae prefer bird cherry leaves and only successfully produce offspring on the primary host. 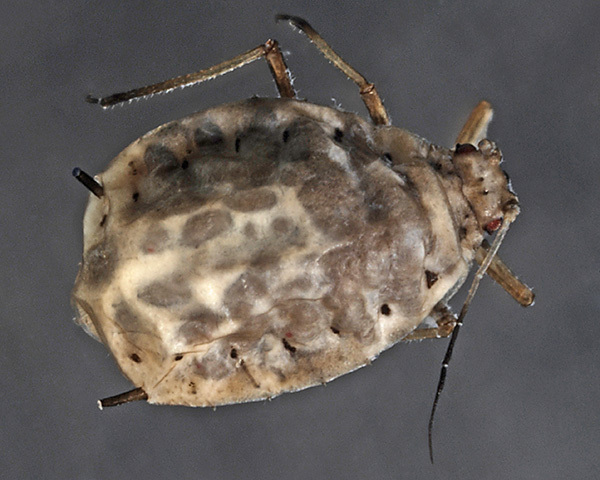 This supports the premise that the change of host is due to a change in the aphid's preferences. In settling choice tests, Glinwood & Pettersson (2000) demonstrated that emigrants collected from the winter host, bird cherry, preferred this plant over a summer host, oats. Emigrants which had left bird cherry for up to 24 hours did not express a preference as a group, and those which had left for 24-48 hours preferred oats. In an olfactometer, bird cherry leaves which had supported spring generations of Rhopalosiphum padi were repellent to emigrants. The study indicated that in Rhopalosiphum padi, host-alternation is driven by behavioural changes which occur in individuals as well as between morphs. Quiroz et al. (1997) showed an arresting effect by volatiles from wheat seedlings and a repellent effect by four volatiles from seedlings infested with aphids at a high population density, The mixture of the four compounds counteracted the attractivity of the volatiles from the uninfested wheat seedling. It was concluded that these compounds played a key role in the spacing behaviour of the aphid on wheat. 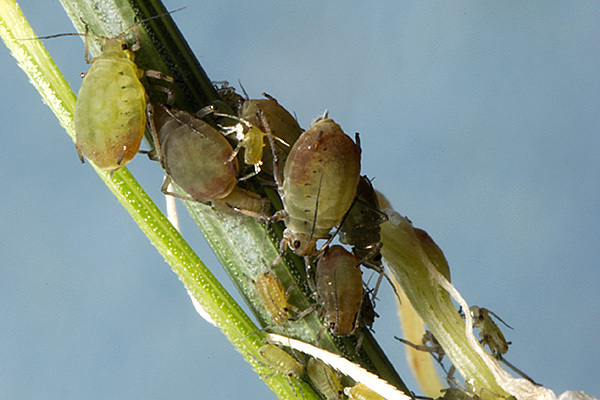 Although many aphids are attracted to yellow, the bird cherry-oat aphid is attracted to green. As part of identifying suitable plant species for crop border plants for seed potatoes Schröder et al. (2014) looked at the attraction of Rhopalosiphum padi to different shades of green in relation to differences in spectral reflectance of three cultivars of a non-host, potato, and two host-plant species, maize and wheat. Choice experiments were carried out under laboratory conditions to evaluate aphid landing preference for stimuli of different colours. Alates preferred to land on the colour targets with the highest reflectance. The results suggest that Rhopalosiphum padi will land in higher numbers on the wheat plants, compared to potato, due to their higher peak percentage reflectance. Leather & Dixon (1982) assessed the secondary host preferences and reproductive activity of Rhopalosiphum padi. Both emigrants (alates leaving the primary host) and exules (alates leaving secondary hosts) preferred to colonise rye grass (Lolium perenne). But emigrants colonised cereals twice as readily as exules. Descamps & Chopa (2011) determined the effects of different cereal crops on reproduction, survival, longevity, and the intrinsic rate of increase of Rhopalosiphum padi under controlled environmental conditions. The intrinsic rate of natural increase was highest on beer barley (Hordeum distichum) and lowest on rye (Secale cereale) and oats (Avena sativa). Populations of Rhopalosiphum padi on cereals are usually found on the lower parts of the plant. Wiktelius (1987) found a relatively large proportion of the field population beneath the soil surface early in the season. He concluded that the preference of Rhopalosiphum padi for the lower part of young spring barley plants is mainly a consequence of the stem base having the highest soluble nitrogen concentration, and that a harsh microclimate sometimes forces the aphids beneath the soil surface. Debarro & Maelzer (1993) looked at the effects of high temperatures on the survival of Rhopalosiphum padi in irrigated perennial grass pastures in south Australia. Survival was reduced when aphids were exposed to air temperatures of at least 36°C (32°C at the base of the sward). The longevity, rate of reproduction and fecundity of individuals also declined as the exposure temperature and duration of exposure increased. In autumn short day-length induces the appearance of gynoparae (Dixon & Glen, 1971) on grasses and cereals. These winged females migrate to bird cherry where senescing leaves provide the aphids with a rich source of food. There they give birth to apterous oviparae. Short day length also induces the somewhat later appearance of winged males on grasses, which migrate to bird cherry where they mate with the oviparae (see pictures below of winged male). Archetti & Leather (2005) monitored colonization of the aphid Rhopalosiphum padi on individual tress of Prunus padus in autumn to see if it provides evidence for the 'coevolution' theory. This theory postulates that autumn colours are a warning signal towards herbivores that lay their eggs on the trees in autumn. According to the coevolution theory, bright colours may be revealing the level of defensive commitment of the plant. On an intraspecific level, therefore, individuals of signalling species will vary in expression of this signal, with defensively committed individuals producing a more intense display, which proves aversive to the monophagous pests that drive the signal evolution. 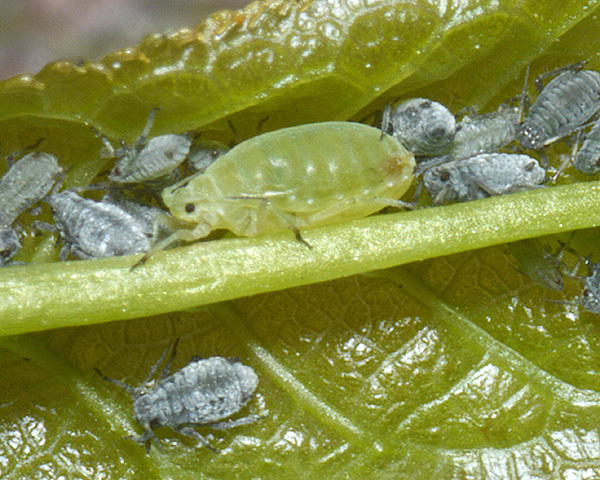 The observed strong preference of aphids for trees with green rather than red leaves was taken as providing evidence in favour of the coevolution theory. Simon et al. (1991) studied life cycle variability in Rhopalosiphum padi by testing the responses to short days of 70 clones at two temperatures (10°C and 15°C) in the laboratory. Of the clones originating from grasses at 15°C, most were entirely parthenogenetic, just 21.5% produced sexual forms. At 10°C the great majority produced sexual forms. 'In the field' in Brittany primary hosts are rather rare, but nevertheless commonly develop spring infestations. It appears that the preponderance of clones producing sexual forms is important for the maintenance of life cycle variability since parthenogenetic genotypes are regularly decimated every few years by severe winters. 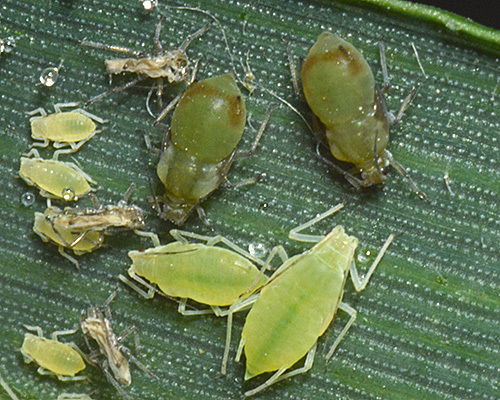 The image below shows a mixed species colony of Rhopalosiphum padi and Metopolophium dirhodum on a wheat leaf in June. This is relatively unusual because the different cereal aphids usually display niche differentiation, with Rhopalosiphum padi on the lower stems, Metopolophium dirhodum on the leaves and Sitobion avenae on the upper stems and flowers. Gianoli (2000) found that, despite some niche separation, Rhopalosiphum padi and Sitobion avenae do compete on wheat plants. However, Honek et al. 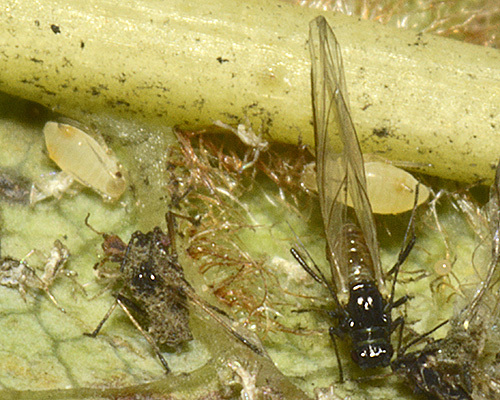 (2006) concluded there was no evidence for interspecific competition between Rhopalosiphum padi and Metopolophium dirhodum (a mixed-species colony is shown below). Muller & Godfray (1989) gave an example of apparent, or indirect, competition between Rhopalosiphum padi on grass and Microlophium carnosum on nettles. Nettle-aphid colonies adjacent to grass-aphid concentrations suffered an earlier population decline because of increased predation by coccinellids attracted to the area by the grass aphids. 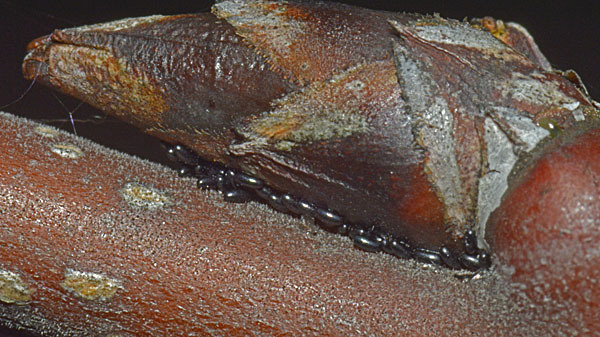 Rhopalosiphum padi is often attended by ants on the primary host inside the rolled leaf gall (see first picture below). In our experience this is not always apparent as the ants are very sensitive to disturbance and rapidly leave the gall if it is opened. Pålsson (2002) looked at ant attendance of Rhopalosiphum padi on both the primary and secondary host. 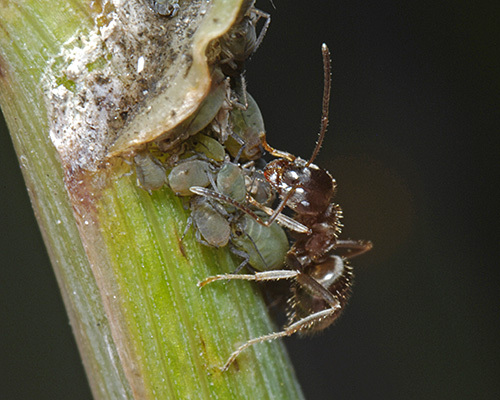 On the primary host the relationship between Formica rufa and Rhopalosiphum padi is mutualistic with the ants deterring predators (specifically coccinellids) resulting in a higher aphid population growth. In cereal fields tending was much rarer (see second picture below), and ants did not seem to affect aphid population growth. 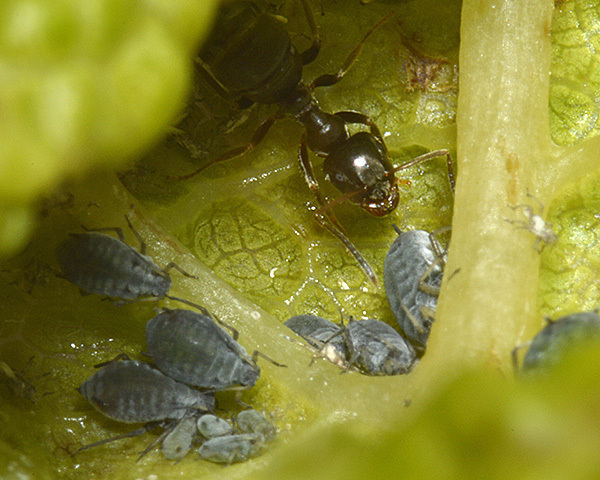 Ants are not the only insects attending colonies of Rhopalosiphum padi on their primary host. 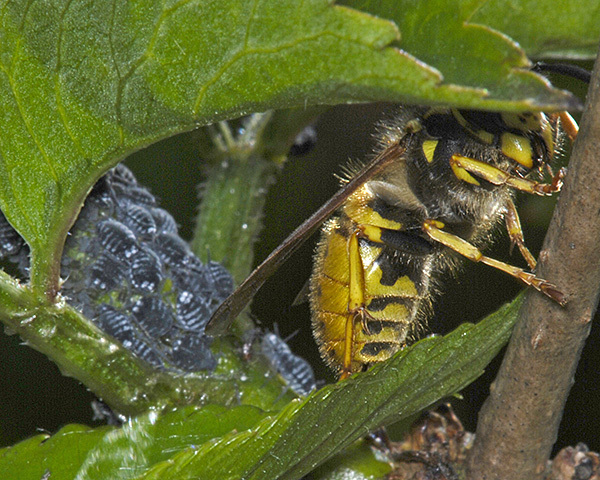 Wasps, especially Vespula spp. commonly visit colonies for the abundant honeydew (see pictures below). Leather & Lehti (1982) followed populations of the bird cherry-oat aphid on the primary host Prunus padus and in fields of barley, oats, rye and wheat. 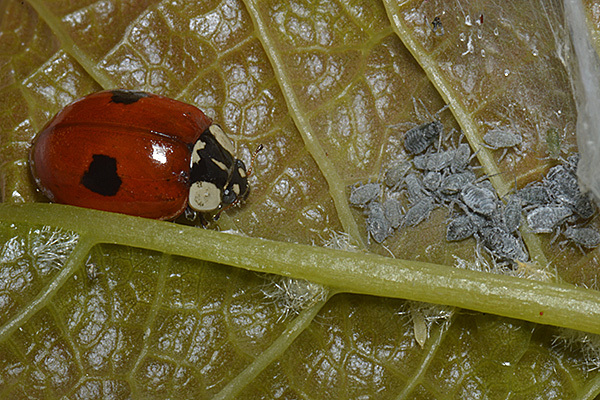 Predators, mainly the ladybirds Coccinella 7-punctata and Adalia bipunctata, were numerous on the primary host, but had little effect on aphid populations, the decline in population being due to the effects of emigration to their secondary hosts. In autumn, spiders and syrphid larvae (see pictures below of larva and adult) were most abundant on bird cherry. In cereals the most common predators were Coccinella septempunctata and a Tachyporus species. Chiverton (1987) studied predation of Rhopalosiphum padi in spring barley by polyphagous predatory arthropods by either gut dissection or a Rhopalosiphum padi-specific antiserum in enzyme linked immunosorbent assay (ELISA). Overall 18% of carabids dissected were shown to feed on Rhopalosiphum padi during the aphids' pre-peak period. However, there was no relationship between percentage carabids with that species in the diet and aphid densities. Overall 11% of predators examined in ELISA gave positive reactions to the Rhopalosiphum padi antiserum. 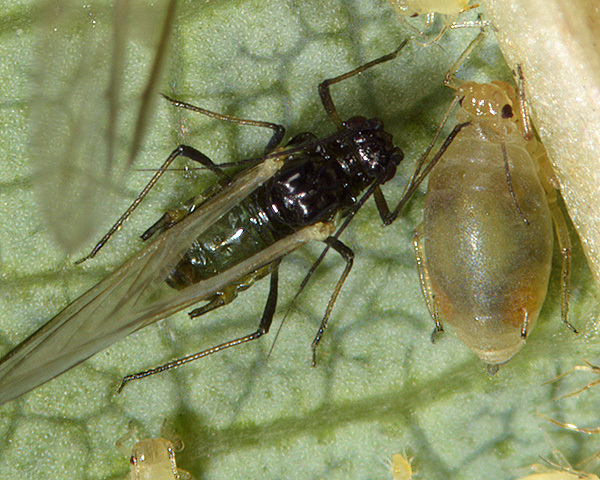 Relatively high proportions of linyphiid and lycosid spiders were positive throughout the aphid pre-peak period. Toft (1995) further investigated spider predation of cereal aphids. 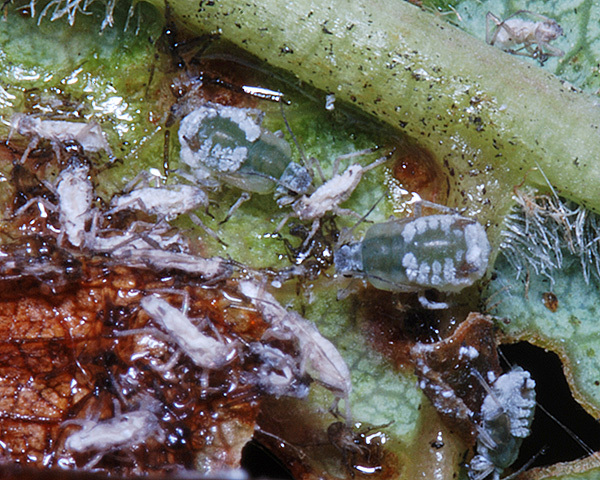 Aphids ranked bottom in prey preference of spiders, and first instar spiderlings were unable to develop on a pure diet of Rhopalosiphum padi. 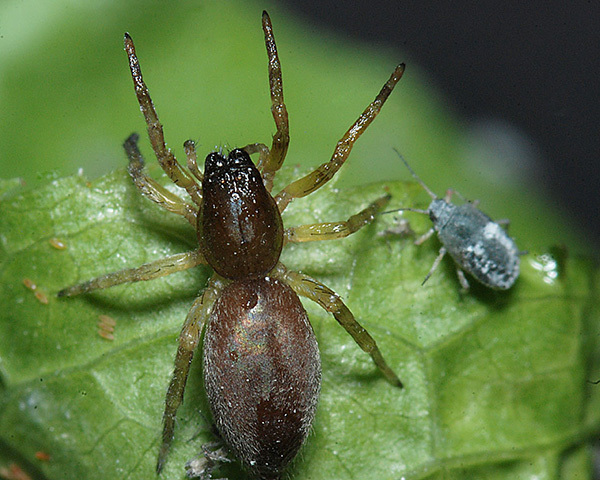 It was concluded that Rhopalosiphum padi contains some elements that are nutritionally valuable to spiders, but also contains deterrent or toxic substances that prevent spiders from utilizing aphids. Rhopalosiphum padi has been recorded from 27 Prunus species. Blackman & Eastop list 8 species of aphid as feeding on bird cherry (Prunus padus) worldwide, and provide formal identification keys. 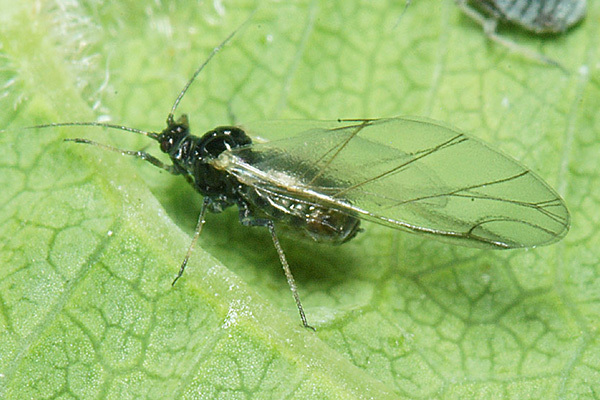 Of those aphid species, Baker (2015) lists 4 as occurring in Britain: Brachycaudus schwartzi, Hyalopterus pruni, Myzus padellus and Rhopalosiphum padi. Aside from grasses, sedges and cereal grops, Rhopalosiphum padi has been recorded from plants as diverse as iris, onion and poppy. Although the bird cherry-oat aphid (Rhopalosiphum padi) is a fairly common cereal aphid in Britain, its winter host - bird cherry (Prunus padus) - is surprisingly rare, at least south of the Scottish border. This may explain why the aphid is not a serious cereal pest in England, whereas it certainly is in northern Europe (Leather et al., 1989). Feeding by the bird cherry-oat aphid causes leaves of grasses and cereals to roll and form a spiral. Spring cereals are most affected, although direct feeding damage is seldom a major problem. 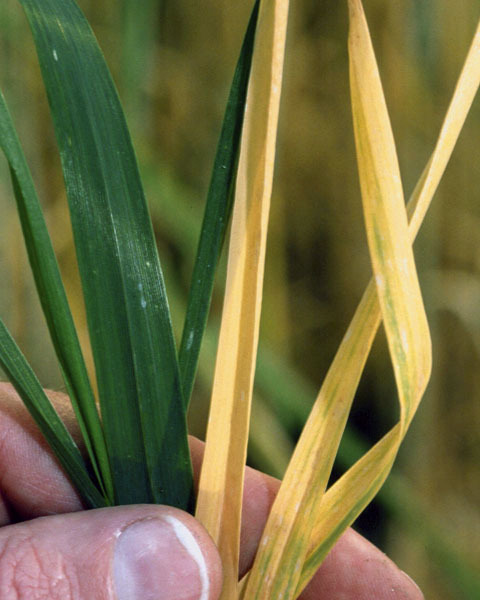 More serious damage results from the transmission of several viruses, the most serious of which is barley yellow dwarf virus (BYDV). BYDV turns barley and wheat yellow (see first picture below) and oats reddish. 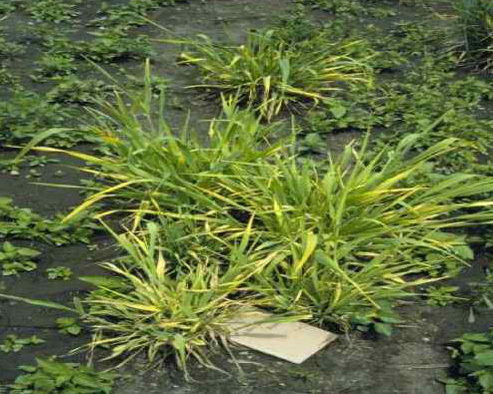 Affected plants are severely stunted and non productive (see second picture below). Chemical control is widely used to control both Rhopalosiphum padi and the other cereal aphids. Systemic insecticides are reported to be more effective than non-systemic ones. Seed treatment of winter cereals can provide protection from aphid infestation in the early developmental stage and prevent the spread of Barley Yellow Dwarf Virus. Since virus transmission is not a simple function of aphid numbers, it is unclear how useful economic thresholds are. Plantwise indicates that threshold numbers for spraying and forecast systems are now commonly used, so insecticides are only sprayed during significant infestations (for example Smeets et al. (1994) describe a computer-based advisory system for pest and disease management in spring and winter wheat in the Netherlands and Belgium.) However, the Home Grown Cereals Authority (HGCA) in Britain states that no satisfactory thresholds for treatment exist for control of vectors of barley yellow dwarf virus implying that regular 'prophylactic' spraying is necessary. 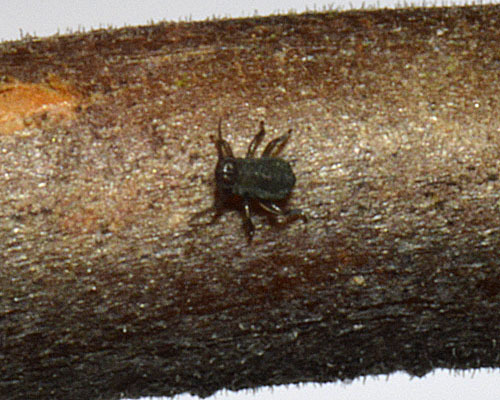 Annetts (2012) has advocated use of the new insecticide sulfoxaflor against Rhopalosiphum padi and Rhopalosiphum maidis in Eastern Australian cereals. Cultural control is also vital for effective control. The most important component of cultural control is delayed planting of winter cereals, which limits the opportunity for colonisation and can reduce the spread of Barley Yellow Dwarf Virus by up to half. 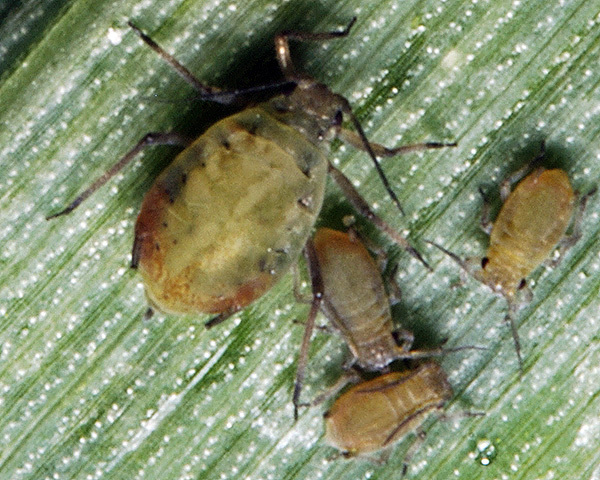 In addition volunteer cereal plants and overwintering stubble, which provide optimal feeding ground for aphids, should be destroyed before the preparation of the field for the new crop. 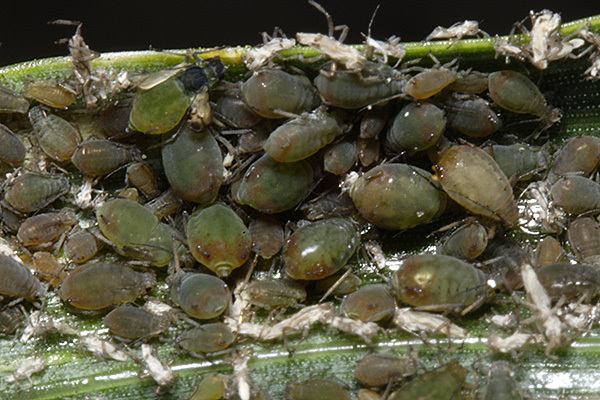 Encouraging natural enemies of cereal aphids is also beneficial. Helenius (1990) demonstrated that reducing the density of generalist predators resulted in an increase in peak population densities of Rhopalosiphum padi and a decrease in oat yield. Ostman et al. (2001) measured the impact of natural enemies on the population development of Rhopalosiphum padi on conventional and organic farms. 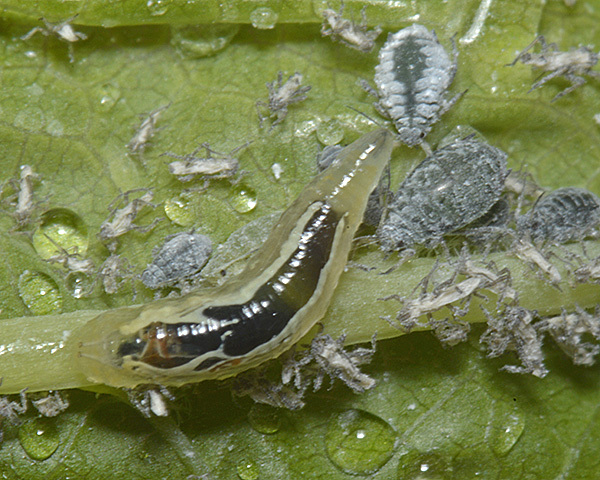 Natural enemies had a greater impact on Rhopalosiphum padi establishment on organic farms than on conventional farms. Irrespective of farming system, landscapes with abundant field margins and perennial crops were associated with low Rhopalosiphum padi establishment. After establishment, there was no difference in ground-living enemy impact on Rhopalosiphum padi population growth rate between farming systems, but impact was greater in landscapes where arable land was contiguous. Pettersson et al. (1994) tested a novel approach to control by applying methyl salicylate, a volatile component of Prunus padus, the winter host of Rhopalosiphum padi, to the cereal summer host. In Sweden, this compound significantly decreased colonization of field grown cereals by Rhopalosiphum padi and in the U.K, populations of Sitobion avenae and Metopolophium dirhodum were significantly lower on treated plots. These results were followed up by Ninkovic et al. (2003) who used both methyl salicylate and several other volatiles termed 'density related substances' that are released at the feeding site when a certain density threshold is exceeded. These volatiles increase the sensitivity of aphids to disturbance and promote mobility of already active individuals. Treatment of the crop with these chemicals caused a significant delay in aphid establishment in the crop and reduced the average infestation by 25-50% compared with the untreated control. We especially thank Middle Farm, East Sussex and Railway Land Project, Lewes for their kind assistance, and permission to sample. Helenius, J. (1990). Effect of epigeal predators on infestation by the aphid Rhopalosiphum padi and on grain yield of oats in monocrops and mixed intercrops. Entomologia experientia applicata 54, 225-236. Leather, S.R. (1983). 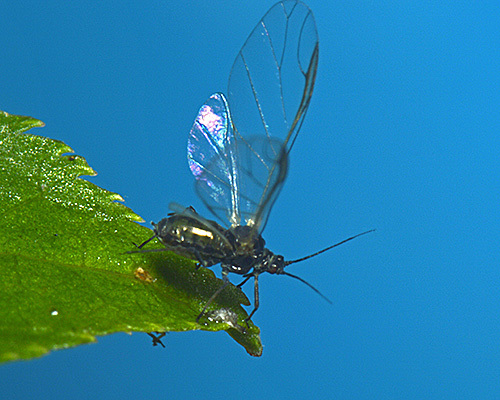 Factors affecting egg survival in the bird cherry-oat aphid, Rhopalosiphum padi. Entomologia Experimentalis et Applicata 30(2), 197-199. Smeets, E. et al. (1994). EPIPRE, an up to date link between research and today's farming practice. Mededelingen - Faculteit Landbouwkundige en Toegepaste Biologische Wetenschappen, Universiteit Gent 1994 59 No. 3b, 1233-1239.